Coach Geordie McCallister (left) and manager Richard McMinn (right) welcome new signings Colin Cunningham, Neil Clydesdale and Jeff Brady to Banbridge Rangers. Banbridge Rangers have got their preparations for next season kicked-off with three new recruits. Signing on at Cheney Park are Neil Clydesdale, who rejoins from Dollingstown, Jeff Brady and Colin Cunningham. All three have been signed from Championship clubs with Brady rejoining from Loughgall and Cunningham also signing from Dollingstown. Clydesdale returns to Rangers, where he was a fans’ favourite between 2008-2012, after three seasons at Planters’ Park. Clydesdale was Dollingstown’s second top scorer in Championship Two. Jeff Brady also endeared himself to the Cheney Park faithful through his performances during his five month stint last season, before he returned to Loughgall in the January transfer window. 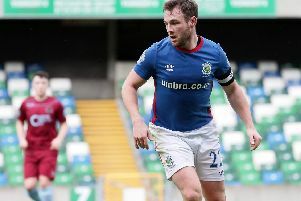 The talented left footer, who represents Northern Ireland as part of the Regions Cup squad, sustained a broken ankle after his return to Lakeview Park but is hoping to be ready to go once the 2015/16 season begins. Cunningham is a striker who is well known to Banbridge Rangers as he was the catalyst for Dollingstown’s dominance of Intermediate A and promotion.